Roof Medic specializes in the application of single-ply membrane roofing systems, or TPO Roofing, in addition to our Duro-Last commercial roofing system. There are three different varieties of the single-ply roofing systems that are widely used among commercial roofing contractors in the Oklahoma City metro area. Those three include EPDM, the PVC and the TPO. Roof Medic proudly represents EverGuard Extreme TPO Roofing Systems. 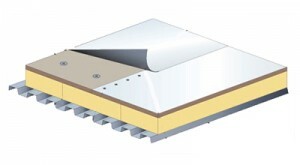 You can read more about this TPO Roofing System Here. Below you will find a brief description of each roofing system. Included with their composition and benefits, we will provide you the basic information for each roofing systems. EPDM is an elastomeric polymer that has been synthesized from ethylene, propylene, and a small amount diene monomer. An EPDM membrane is a cured material and is classified as a “thermoset”. This is simply defined as such that the polymer’s molecular structure is “set” as a result of heating during the manufacturing process. EPDM sheets are available in a variety of colors, and range in thickness from 30 – 90 mils. EPDM membranes can be installed using one of three methods: ballasted with large stones, fully adhered with an approved adhesive, and mechanically attached to the roof deck. PVC or polyvinyl chloride is produced by the polymerization of vinyl chloride monomer. PVC membranes can be non-reinforced or reinforced with glass fibers or polyester fabric. They come in thicknesses ranging from 45 – 96 mils. PVC membranes can be installed by mechanically attaching the membrane to the roof deck. They are then fully adhered with an approved adhesive, stone ballasted, and paver ballasted. PVC membranes do not cure after exposure to the elements therefore remains heat weldable throughout the lifetime of the roof. If you are in the Norman, Oklahoma or the Oklahoma City metro area, Roof Medic is your single-ply membrane roofing contractor. We are proud to be your complete resource for all your commercial and industrial roofing needs. Feel free to call us today at (405)367-6951 for a free, comprehensive roofing proposal.